The famous space telescope has been in orbit 25 years. This is how it ushered in a new age of astronomy. This photo essay, with an introduction by astrophysicist Mario Livio of the Space Telescope Science Institute, first appeared in The Genius Factor, an Air & Space Collector’s Edition published in Fall 2013. Ask any person on the street to name one telescope, and there’s little doubt they would say the Hubble Space Telescope. Thanks to the Hubble, the excitement of cosmic discoveries has become part of the general culture, rather than being only the province of professional astronomers. When considering Hubble’s major scientific achievements, we should recognize that because it studies an extremely wide range of astronomical phenomena, discoveries rarely belong exclusively to Hubble. More often, it was the combination of observations from several telescopes that led to the breakthrough findings. Hubble did play an absolutely crucial role, however, in all of the science highlighted here. Philosophically, Hubble has changed our views on the physical place of humans in the cosmic landscape by strengthening our understanding of the “Copernican principle”—the idea that Earth and humans do not occupy any special place in the universe. And yet, Hubble has also shown us that we do live at a rather special point in time. Through a series of deep-field observations, Hubble has expanded our horizons to unprecedented distances, showing us that in the observable universe, there are hundreds of billions of galaxies. A combination of observations from ground-based telescopes, along with those from the Kepler, Spitzer, and Hubble telescopes, has convinced even skeptics that planets are also very common. The Milky Way galaxy alone is, in fact, teeming with billions of extrasolar planets, many of them in the “habitable zone”—meaning they could have liquid water—around their parent stars. For the first time, Hubble has provided information about the atmospheric composition of a few extrasolar planets, and has even imaged some planets in orbit around their host stars. But the unremarkable nature of our physical location doesn’t end there. We have learned that the center of our home galaxy contains a black hole with the mass of about four million suns, but Hubble has found that nearly every galaxy with a central stellar bulge contains a supermassive black hole. The universe is teeming with them. Finally, Hubble-based research into the universe’s expansion rate combined with data from other projects has shown that ordinary matter—the stuff that stars, planets, and humans are made of—constitutes only 4.9 percent of the cosmos. Copernicus was right: In this universe, we are not at center stage. The situation is very different, however, when it comes to our place in time. Hubble has played a key role in determining the age of the universe—about 13.8 billion years, with a possible error of no more than about three percent. Through its deep-field observations, Hubble has mapped the history of the birth rate of stars, which reached its peak about nine to 10 billion years ago and has been declining ever since. Our universe is definitely past its prime. Hubble has also determined that the expansion of the universe started to accelerate around six billion years ago, apparently propelled by the repulsive force of “dark energy.” While the precise nature of dark energy is not known, observations to date tell us that it is energy associated with empty space. If dark energy represents the energy of the physical vacuum, the expansion of the universe will continue to accelerate forever. The physical and philosophical implications of such a universe are far-reaching. About one or two trillion years from now, the light from all the galaxies (outside those in our own Local Group) will be moving away to the point that observers in the Milky Way galaxy (if they still exist) will not be able to see any other galaxy. Such observers will find it essentially impossible to reconstruct the true history of the universe. While a trillion years may sound like an incredibly long time, in the cosmic chronicles of an ever-accelerating universe, it is really just a fleeting moment. In other words, we are fortunate to live at a special time—one during which telescopes such as Hubble can make progress in deciphering nature’s secrets. We should take full advantage of this finite opportunity. In addition to its scientific achievements, discoveries by Hubble have formed the basis for what is arguably the most successful science outreach program in history. Art critics have even compared the telescope’s images to the best works of art of our time. Hubble’s longevity has turned it into an icon of science for an entire generation. I have spent a significant part of my career as an astrophysicist interpreting Hubble data, including four years heading the office that conducts the outreach and education activities. After five servicing missions by space shuttle astronauts, the last in 2009, Hubble began to perform almost like a new observatory, even though it was approaching 20 years in orbit. NASA plans to continue Hubble operations until at least 2018. With the execution of six “frontier” deep-field observations due in the near future, we can be sure that new discoveries wait just around the corner. These will pave the way for Hubble’s successor: the James Webb Space Telescope. In December 1995, Hubble spent 10 days peering into a tiny patch of the sky in the constellation Ursa Major. The result was the Hubble Deep Field, revealing nearly 3,000 galaxies in what was the longest look back to the beginning of the universe. Since then, astronomers have continued to push Hubble’s view further and further back in time. 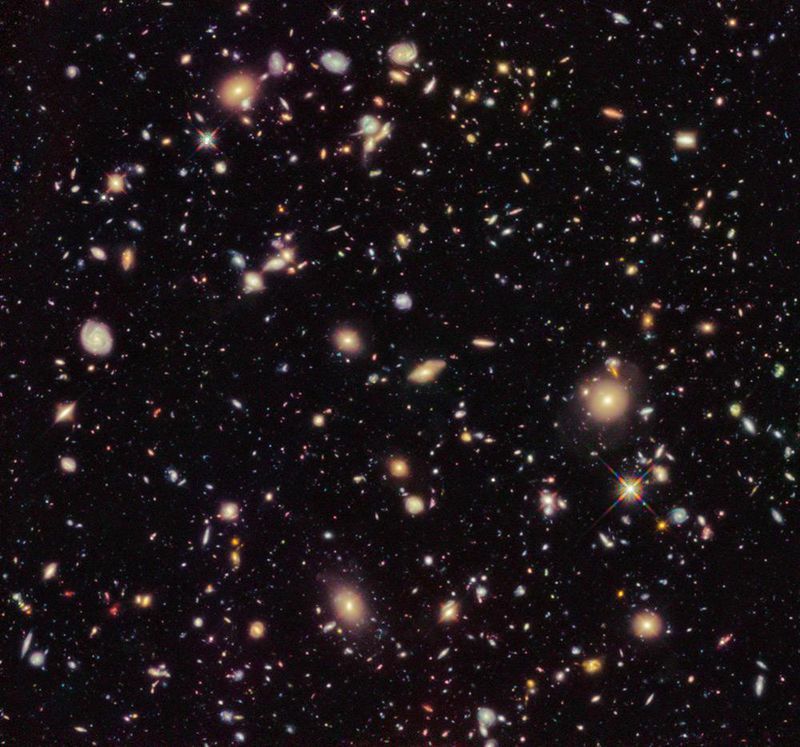 The latest iteration is the Ultra Deep Field, taken over 200 hours in August and September 2012 with the Wide Field Camera 3, installed in 2009 during Hubble’s last servicing mission. The image was made by a team at the California Institute of Technology in Pasadena, led by Richard Ellis. The 1995 version, made with the Wide Field and Planetary Camera 2, was a look back at the 13.8-billion-year-old universe when it was a youthful one billion years. Some of the galaxies in the Ultra Deep Field date back to just 350 million years after the Big Bang, or about three percent of the universe’s age, explains Ellis. “The results of this remarkable image are consistent with the picture that galaxies ‘switched on’ when the universe was about 200 million years old, and gradually developed their forms,” says Ellis. “Cosmic Dawn [the era when matter began to form stars and galaxies] was not likely a dramatic event narrowly confined in time.” Indeed, the series of deep fields from Hubble has shown that the farther back astronomers look, the more smoothly the number of galaxies and other objects declines. Astronomers’ knowledge of the early universe has benefited greatly from Hubble’s observations, but the picture is not complete. Ellis believes even earlier galaxies will be found. Hubble won’t be the one to find them, though, since astronomers have now taken images with all the filters in WFC3’s near-infrared channel. Deep field exploration will be one of the many tasks handed off to Hubble’s successor, the James Webb Space Telescope.